Greg Howe's top 5 tips for guitarists: "Having the ability to be as expressive as possible is now much more of a priority than the ability to impress"
Over the course of three decades, Greg Howe has cemented his name into the upper echelons of renowned guitarists, earning respect from fans, critics, and peers. 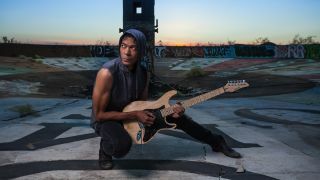 Although often associated with the shred guitar scene, thanks in no small part to his 1988 self-titled debut album for Shrapnel Records, Howe long ago diversified his repertoire to include rock, pop, and fusion. A producer, songwriter, and arranger, Howe has recorded almost a dozen albums. He is also widely recognised as a session player and sideman whose work has been featured on recordings and tours by a cross-section of artists, among them Justin Timberlake, Rihanna, and Enrique Iglesias. And, of course, there are the collaborations: Victor Wooten, Richie Kotzen, Jason Becker, Billy Sheehan, and Stu Hamm are but a few. Last year, Howe returned to his instrumental roots with Wheelhouse, an album he calls his most personal to date. He expanded his resume to include Simon Phillips’ prog band, Protocol, an unexpected move that he describes as serendipitous. “My goal in 2017 was to do a U.S. tour in August and then go to Europe,” he says. “The booking agent was looking for someone with marquee value, like Dennis Chambers. I called him, but he’s so in demand that he was just too busy. So I decided to call Simon Phillips, because I’d worked with him years before. “The next day, as I’m dialling, the phone rings and it’s him. I’m thinking my manager must have sent him an email, but he was calling to find out if I’d join Protocol, because Andy Timmons had left. It was a great situation. I could record his album, and he had a lot of touring lined up for Europe during the same time I planned on doing my tour, so I decided to move my tour to 2018, which is why I’m doing it now. “Honestly, I was a little tentative at first because prog didn’t feel like music I wanted to do. So I said, ‘It sounds interesting. Send me some material.’ It was thoughtful music, not music written to show off what you can do. There were real landscapes and stories, heartfelt conveyance of emotional stuff, and it was really musical, so it was very attractive. When MusicRadar caught up with Howe, he was preparing for his own long-awaited European tour. Joining him are bassist Ernest Tibbs (Protocol, Allan Holdsworth) and drummer Gianluca Palmieri (David Garfield, Frank Gambale). “In a three-piece scenario, I’m not only the harmony backdrop but I’m also the lead singer, so to speak,” he says. Howe teaches guitar through private instruction via Skype and often holds clinics while on the road. But if you’ve come here for tips about theory and technique, guess again. “It’s such a humungous topic, and it’s so broad, that in some ways you can talk about it all day,” he says. “It also depends on the situation the musician is in. A lot of people are probably thinking, 'Don’t you think that warming up is a good idea and a priority?' Yes, it is, but the things I’m talking about are more fundamental as far as their role in the grand scheme of this. “When it comes to live playing, which is what I’ve been doing a lot more of lately, the thing that is most important is that we are listening, really listening, to each other, so that we can have spontaneous moments, lock into that feel that’s irresistible, be ready to pick up on the motif that a musician may play, or enhance a soloist and comp correctly, or comp in a way that highlights what they’re doing. “When you can listen like that, and the band really becomes connected with that chemistry, amazing things can happen each night and they can be different each time. That brings the fun element, fun brings good energy, people sense that energy, and when people watch a band that’s having a good time, that’s a much more fun show to watch than bands that seem to just be playing complicated things, or playing anything just for the sake of showing you what they’re capable of. “If we’re not having a good time, and we travel all over the world, we’re on buses, in airports, and on long rides together, that’s a lot of work to not have a good time. The whole reason we do this is because we love it - because there are much easier ways to make a living. “The whole point of this is that I’m drawn to music and I can’t keep my hands off of it. It’s too powerful and connected to me. It’s something I need to do, and if I’m going to spend this much time in music, it has to be fun. “This is why, no matter how much money we’re making, no matter how much superficial success is coming our way, success to me is measured by only one thing: how much fun am I having. I know that sounds cliché, but I’ve walked off tours that paid $5,000 a week and promised 22 months of steady income that way, because it wasn’t fun. “One of the most important things when I’m writing is that I have to love the music. It can’t just be some musical backdrop excuse for playing guitar. It has to be a song that I love, whether there’s a guitar solo in it or not. I have to believe in what I’m trying to convey. “As I get older, tone is becoming a foundational priority for me. When I was younger, I didn’t really connect the importance of tone to a musical statement. Of course you want your tone to sound good, but the real statement is in the music, not the tone - that’s how I used to think. Today I see they’re not disconnected: they’re part of the same thing. “There are statements you can make on the guitar that are big because of the tone. You can sometimes make short, quick statements with massive tone, and you discover afterwards that you don’t need to say much more because it was said so nicely and concisely that adding anything beyond that moment is too much. “This is connected to something we discussed earlier. Whatever you’re doing musically, one of the worst things in the world is to have somebody in your band, regardless of how talented they are, that you don’t like. “If you don’t like their energy, if you don’t like what it feels like to be around them, your music will take a hit and so will your good time, and that’s never worth it. You’d be better off getting rid of the amazing musician who’s cocky, brags, and likes to show up late, and hire someone who is maybe not as talented, but who is a team player and is into camaraderie and having fun. Your music will reflect, big time, who you interact with and the dynamic of that relationship. Greg Howe tours Europe throughout October and November - head over to his official website for more details.